pb a cozy neighborhood brunch spot with a passion for pancakes, waf es, pastries and pies. DeDe Lahman co-founded the Clinton Street Baking Company in 2001, along with husband and business partner Chef Neil Kleinberg. The two met as fellow patrons at a local restaurant. Kleinberg has enjoyed a long culinary career in the city, opening his  rst restaurant, Simon’s, at the ripe old age of 22. He has appeared on numerous cooking shows and televi- sion programs and is the co-author, along with Lahman, of the Clinton St. Baking Co. Cookbook. His pancakes are just as famous, having been voted best in the city by New York Magazine. storefront. Over the years, the Café has expanded twice into adjoining spaces and now seats up to 75 guests, all looking for Austrian comfort food and a pint of German beer. One might say Schrottner’s entire life has been farm-to-table. As a boy growing up on the family farm in his native Austria, he was immersed in the agricultural life. He assisted in growing fruits and vegeta- bles, helped raise the livestock and started working in a restaurant kitchen at 15. Those early experiences with food led to a lifetime of sourcing ingredients and preparing and serving meals. “What we serve is really homey, basic food ... what I grew up with,” says Schrottner of Café Katja’s lunch, dinner and brunch offerings. The menu includes his mother’s meatball recipe, and on a regular basis, the lunch menu features what he calls a “basic goulash you can  nd in every joint in Austria.” Diners likely don’t believe there is anything on the menu that could be considered basic, or that restaurants such as Café Katja are commonplace throughout Austria. His customers may never know, and they probably don’t care, when they are diving into the fresh tomato or roasted beet salad. 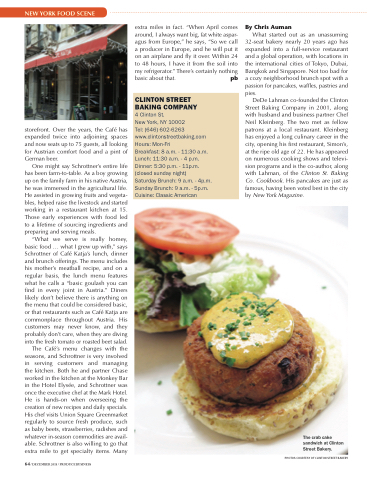 The crab cake sandwich at Clinton Street Bakery.